Make well in center of flour mix and 4 tablespoons of water. Mix well with until dough holds together when squeezed. Add more water if needed 1 tablespoon at a time. If using a processor, dough is perfect when it starts to clean the sides of the bowl. Knead dough a few times and cut in half. Wrap dough in plastic and refrigerate while making filling. Remove dough from fridge roll out each half of dough on parchment or wax paper for a 9” pie crust or 10″ seasoned iron skillet Invert one crust into pie plate or skillet and gently peel paper away. Press dough evenly into place and finish edges as desired. Reserve other half for top of pie. Bake at 400 degrees F for 15 minutes then reduce to 350 degrees for 30 minutes or until pie is golden and bubbly. Let pie rest for at least 20 minutes before serving. 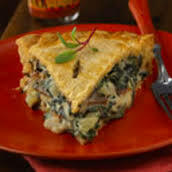 This entry was posted in Food IS Talking Recipes, Healthy Holiday Make-overs and tagged Blackeyed Pea Recipes, Collard Green Recipes, Gluten Free Recipes, Gluten Free Savory Pie, New Year Savory Pie, Southern Recipes, Vegan Savory Pie, Vegetarian Savory Pie on December 30, 2015 by intuitivechef. Pour mixture into pie crust and spread evenly. Arrange pecans halves on top. Bake for 30 minutes. 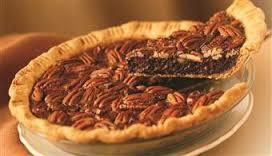 Inspired by my twin brother, this recipe rivals the best pecan pie I’ve ever had. And, NO processed sugar, or artificial ingredients AND all plants! Top it off with my delicious homemade coconut whipped cream. Add butter and pulse until butter is roughly cut in (8-10 seconds). Note: This can be done by with a fork or your fingers). Turn processor to on and add water slowly through feeder tube until dough begins to clump and cleans the edge of bowl. If too wet and sticking to sides add a little more flour (1 teaspoon at a time). If too dry add more water (1 teaspoon at a time). Dough should be very soft, but not sticky. Remove and pat into ball. Bake at 425 degrees for 10 minutes. Move to cool spot while you make the filling. 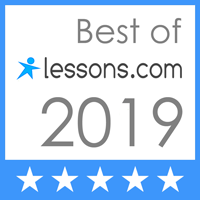 This entry was posted in Food IS Talking Recipes, Healthy Holiday Make-overs and tagged chocolate pecan pie, diabetic friendly pecan pie, glutenfree pecan pie, healthy holiday desserts, pecan pie, vegan pecan pie, vegetarian pecan pie on November 25, 2015 by intuitivechef. In medium sauce pan or skillet melt butter over medium high heat. Whisk in flour, nutritional yeast and poultry seasoning stirring constantly until blended and smooth. Slowly whisk in broth a little at a time as you stir constantly. Note: do not pour in broth all at once. You can always add more if the gravy gets too thick – easy. If it’s too thin a little more difficult to fix). Bring to simmer and cook until gravy is just starting to thicken. Remove from heat and whisk in dissolved miso. If gravy still needs a little thickening return to simmer for another minute. This gravy is an amazing knockoff of the original! Put it to the blind taste test. And, it’s simple enough to serve all year over biscuits, on mash potatoes or try it in a vegetable pot pie. 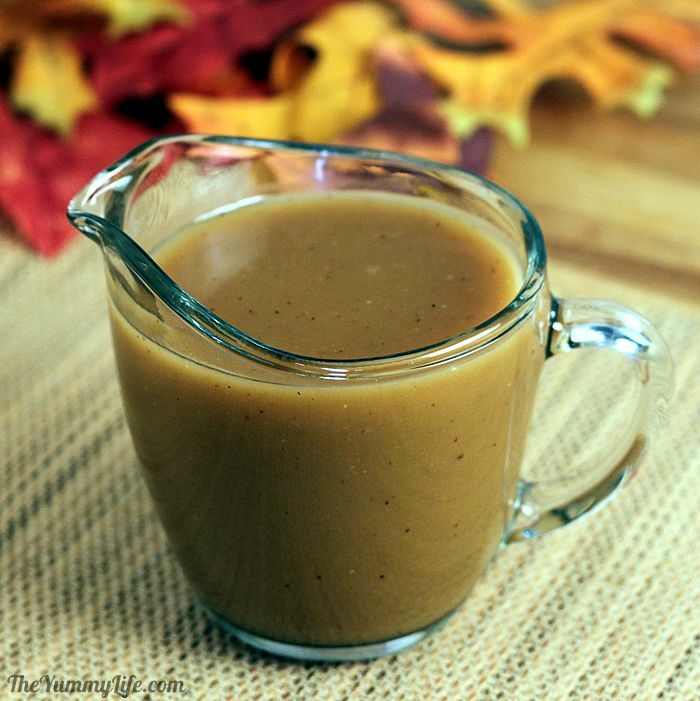 This entry was posted in Food IS Talking Recipes, Healthy Holiday Make-overs and tagged No Giblet Gravy, Vegetarian Turkey Gravy on November 17, 2015 by intuitivechef. Over time, I’ve made many versions. This delicious version is sugar-free. Trust me when I say this combo is extraordinary! After the celebration serve the left-overs on toast, nut butter sandwiches and my favorite – spread it on a hunk of dark chocolate….Yummmm! Happy Holidays! Add all ingredients into large saucepan. Bring to boil and reduce heat to simmer. Cook for about 10 minutes or until apples and cranberries are soft. Remove rosemary sprig. Place in cover dish and chill. Serve with a fresh sprig of rosemary garnish. 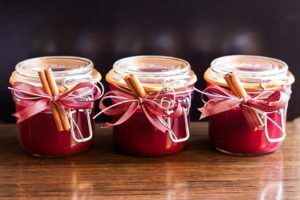 This entry was posted in Food IS Talking Recipes, Healthy Holiday Make-overs and tagged canned cranberry sauce, sugar-free cranberry sauce on November 14, 2015 by intuitivechef. Pre-heat oven to 375 degrees. Place iron skillet* in hot oven while mixing together ingredients. **Corn, Soy & Canoli are the most genetically modified food crops on the planet. Buy organic to avoid GMOs. Unless you have access to local, farm fresh eggs from well cared for chickens, look for eggs that say on the carton “organic” and “pastured” – NOT “pasteurized” . The chicken and egg industry is a very cruel one. Let’s vote with our wallet. Preheat oven to 350 degrees. Preheat deep 12″ iron skillet or 9 x 13 glass pan. Add broth and milk. Mix until well blended. Taste adjust seasonings. Add a little more milk if needed. Dressing should be very moist, but not runny. Gently fold in eggs or tofu. Growing up, when everyone was focused on the bird, I had my sites on the cornbread dressing and cranberry sauce. 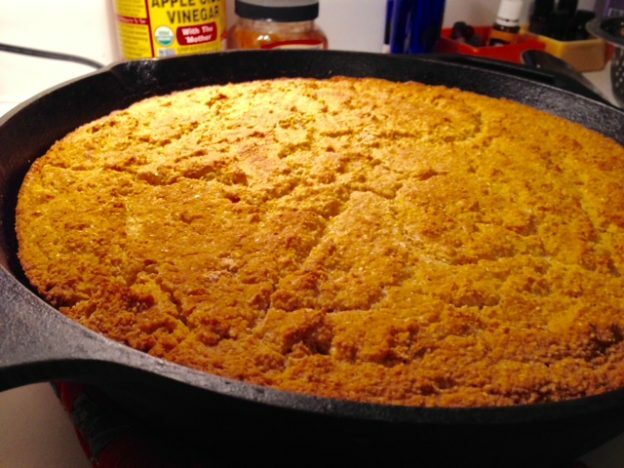 In my family, the cornbread dressing IS the main attraction. Thanksgiving dinner is not complete without my Grandma’s dressing. After Grandma passed my Dad took over. It doesn’t matter whose house we end up at for this celebration, as long as he brings the dressing. Last Thanksgiving my Dad and I cooked at his house (the house we grew up in). I made my version and he made his. His comment, “Well Gail this is just larapin! The highest compliment coming from my Dad! I hope you enjoy my version of this southern classic! Stay tuned for “No-Giblet Gravy” and “Cranberry, Apple & Rosemary Relish”. You can’t have cornbread dressing without the gravy and cranberry sauce – Right? 1. Avoid using soap in your iron skillet unless absolutely necessary. Scour (with plastic – not metal) and rinse with hot water. If you do end up burning food in your skillet do not scrape it! Fill pan with water and heat to simmer for a few minutes. The food will come right off. 2. To dry skillet thoroughly, place it over low heat or in a warm oven for a few minutes. Store in oven when dry to prevent any moisture from coming in contact with pan. Never put oil on a damp skillet – It will lock in the moisture and cause it to rust – overnight! Oil is only necessary for long-term storage to protect it from rusting when humid. 3. Never cut your skillet with a knife. It will damage the seasoning and cause it to stick in that spot. You will have to re-season it. This entry was posted in Food IS Talking Recipes, Healthy Holiday Make-overs and tagged Plant-based Holiday Recipes, Southern Cornbread Dressing, Vegetarian/Vegan Cornbread Dressing, Vegetarian/Vegan Holiday Recipes on November 8, 2015 by intuitivechef.